For the song by Lucinda Williams, see Car Wheels on a Gravel Road. Drunken Angel (酔いどれ天使, Yoidore tenshi) is a 1948 Japanese yakuza film directed by Akira Kurosawa. It is notable for being the first of sixteen film collaborations between director Kurosawa and actor Toshiro Mifune. Sanada (Takashi Shimura) is an alcoholic doctor in postwar Japan who treats a young, small-time hood named Matsunaga (Toshiro Mifune), after a gunfight with a rival syndicate. The doctor diagnoses the young gangster with tuberculosis, and convinces him to begin treatment (and quit boozing and womanizing). The two enjoy an uneasy friendship until the gangster's former boss, Okada, who is also the former abusive boyfriend of the doctor's female assistant, is released from prison and seeks to take his gang over once again. Matsunaga then stops following the doctor's advice, slipping back into old habits and going to night clubs with Okada. Matsunaga realizes that Okada is not a true friend when Okada threatens to kill the doctor if he doesn't reveal the female assistant's whereabouts, and then finds out that his boss is grooming Okada and merely using Matsunaga as a pawn to be sacrificed against the rival gang. When the doctor leaves his house to report Okada to the police, despite the doctor's orders to remain in bed, Matsunaga slips out to confront Okada (who has also managed to steal Matsunaga's girlfriend Nanae) but Matsunaga is killed in the ensuing knife fight. A local shop-owner woman who had feelings for Matsunaga plans to take Matsunaga's ashes to be buried on her farm, where she had offered to live with him, and the doctor learns that one of his younger patients had followed his advice and has been fully cured of tuberculosis. While looking for an actor to play Matsunaga, Kurosawa was told by one of the casting directors about Mifune, who was auditioning for another movie where he had to play an angry character. Kurosawa watched Mifune do this audition, and was so amazed by Mifune that he cast him as Matsunaga. 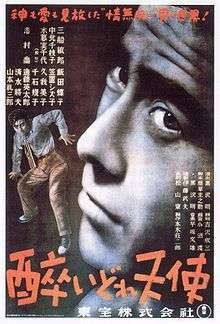 On the film's Criterion Collection DVD, Japanese-film scholar Donald Richie comments that Kurosawa was impressed by the athletic agility and "cat-like" moves of Mifune, which also had bearing in his casting. Censorship issues in Drunken Angel are covered extensively in a supplemental documentary by Danish film scholar Lars-Martin Sorensen, created for the Criterion Collection DVD release of the film, entitled Kurosawa and the Censors. Produced and released during the American occupation in Japan, the Drunken Angel screenplay had to comply with a censorship board issued by the U.S. government. The board did not allow criticism of the occupation to be shown in Japanese films at that time. Kurosawa slipped several references to the occupation, all of them negative, past the censors. The opening scene of the film features unlicensed prostitutes known as "pan pan" girls, who catered to American soldiers. The gangsters and their girlfriends all wear Westernized clothing and hairstyles. Kurosawa was not allowed to show a burned-out building in his black-market slum set, but he did heavily feature the poisonous bog at the center of the district. English-language signage was also not allowed, but the markets on set have several examples of English usage on their signs. The dance scene in the nightclub features an original composition ("Jungle Boogie", sung by Shizuko Kasagi) with lyrics by Kurosawa, satirizing American jazz music. The censorship board was unable to catch these breaches due to overwork and understaffing. Kurosawa used music to provide contrast with the content of a given scene. In particular was his use of The Cuckoo Waltz by J. E. Jonasson. During filming, Kurosawa's father died. While he was in a sad state, he heard The Cuckoo Waltz playing in the background, and the whimsical music made him even more depressed. Kurosawa decided to use this same effect in the film, at the low point in the life of Matsunaga, when the character realizes that he was being used all along by the crime boss. Kurosawa had the sound crew find the exact recording of The Cuckoo Waltz that he had heard after his father died, and had them play the instrumental beginning of the song repeatedly for the scene in which Matsunaga walks down the street after leaving the crime boss. Kurosawa also wanted to use, in the opening scene for Okada, to have him perform on guitar Mack the Knife, originally "Die Moritat von Mackie Messer" which was a song composed by Kurt Weill with lyrics by Bertolt Brecht for their music drama Die Dreigroschenoper, but the censors rejected it as they did not want anything "German" in the film. 1 2 3 From the documentary, Kurosawa: It Is Wonderful to Create, available on The Criterion Collection DVD. Wikimedia Commons has media related to Drunken Angel.